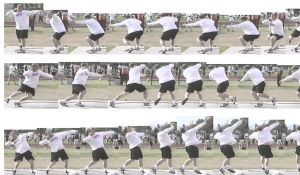 The debate between the effectiveness of the glide technique in shot put, versus the spin or rotational technique, is an age-old one. There is one faction that considers the rotational technique to be undoubtedly the most effective one. On the other hand, some tend to disagree by stating that the simplicity of the glide technique is merely deceptive, and that the technique is in fact highly effective. The humor lies in the fact that although this debate is a recurring one, there are facts which reveal that both techniques are equally “effective”. Also, it is quite incorrect to proclaim one technique to have a sound edge over the other, because in shot put, it is the power position which is most critical. The use of any technique would prove ineffective unless it ultimately aids the thrower in attaining the ideal power position. Hence the effective use of either of the techniques to put the full force of the body on the shot in the power position is the primary objective. Until 1951, the movement in the shot-put circle was characterised by the thrower standing sideways, and only a quick shuffle and hop of the legs would constitute the dominant throwing technique. It was in 1951 that Parry O’Brien altered the glide technique, and this enhanced its effectiveness to a great extent. In the “O’Brien style” or the “O’Brien glide”, the putter faces the back of the circle, beginning with a crouching position, and proceeds with kicking his leading leg to the front of the circle, while the other leg follows in a “gliding” motion. As the thrower crosses the circle, the wrapped up body posture now gradually unfurls with the twisting of the hips, followed by the shoulders, while holding the leading arm upright. The momentum of the throw is inherent in the “glide” or the linear movement of the legs across the circle and the gradual unwinding of the body, helping in creating maximum torque. Gliders generally tuck the ball under the chin, forward of the point of the jaw below the ear. a. The trunk should be actively, or passively as in the case of the T Start, lowered until the lower abdomen and the upper thigh are in contact. b. The CM should be displaced/ unseated to initiate the glide across the circle. - The free leg should be used to balance the preliminary movements and positions of the thrower during the initial single support phase. - The free leg should be drawn into nearly an identical position of flexion relative to the support leg. - The elastic energy stored in the groin/ hamstrings as a result of the complete extension of both legs aid in the recovery of the support/ drive leg under the thrower in the centre of the circle. - The direction of extension leg determines throwing line of direction. In the glide technique there are two types, which are known as the short-long and the long-short. The short-long was popularized by the great shot putter of the 1970′s, Al Feuerbach. The long-short, on the other hand, was more widespread in the Eastern Bloc countries. Shot putters like Ulf Timmermann, Tomasz Majewski and David Strol are some of the athletes in the modern era who employ the glide technique. The glide technique is considered more effective in the initial training stages, and the parts which constitute this technique are not as many or as complex as the rotational technique. Hence, for a beginner, for whom the comprehension of the “power position” is essential, this position proves to be effective. In 1972, the rotational technique was invented by Viktor Alexeyev, who was the coach of the famous putter from USSR, Aleksandr Baryshnikov. That very year, Aleksandr Baryshnikov set a new USSR record by employing the spin technique. Later, in 1976, he would also go on to set a world record of 22.0m, in the process becoming the first man to cross the 22m-mark. The spin rotational technique is characteristic of the discus throw, as the putter faces the back of the circle, and then executes a series of “pivoting” motions with his right leg, while the left helps in stabilizing and controlling the body. The thrower initially turns and plants his right foot in the centre of the circle, which then pivots to help the body gradually move to the front of the circle. And then, with the twisting of the hips and shoulders, the putter achieves the power position, with the leading leg locked firmly while executing the throw. Unlike the glide technique, the spin technique makes use of the rotational momentum generated as a result of the “spin”. The involuntary elasticity which is caused during the second phase of the spin generates enormous amounts of torque, and extra power and momentum. In the final stance, the momentum and power are conserved, with the leading leg firmly planted at the head of the circle. - Spinners generally place the ball into the neck behind the point of the jaw below the ear. - The initial position of double support in the rotational style shot put is much like the initial position in the discus. - This drive phase push off is markedly shorter than that of the discus technique. - An aggressive and dominant swing leg action should be initiated at the outset of single support (i.e. once the swing leg foot clears the ring). Most of the American shot-putters favour the spin technique, and it can also be rightfully said that the spin is more popular than the class glide technique. The world record of 23.120 m (75 ft. 10.236 in) set by Randy Barnes in 1990 was the result of the spin technique. However, while it is usually said to be favoured by shorter athletes, that notion is not entirely true – athletes such as Randy Barnes and Ryan Whiting who employ the spin are above 6’3″. 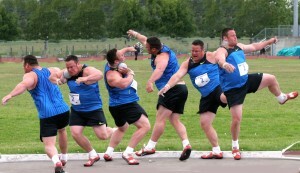 Athletes have to develop a habituation and stabilization of the various movements in this technique. As the spin involves many more moving parts compared to the glide, there is room for more errors or foul throws. The distance of the throw is not just a matter of technique, and the choice of technique is based on the physical abilities of the athletes read together with the coach’s opinions and advice. The athlete’s height, weight, rhythmic ability and explosiveness are all factors that need to be considered when deciding which technique to utilize. The best throw in history was registered by USA’s Randy Barnes, who made use of the spin technique, whereas the second best throw was registered using the glide technique by Ulf Timmermann, the world record holder before Barnes. Technique is essential to an athlete and its importance is simply irrefutable. Yet, it is not the sole factor which helps in achieving a great distance; there are many factors which work together in unison to deliver a world class throw.